From 1988 - 1989, I loved this sitcom, Day By Day. Now at the time, nobody knew that Courtney Thorne-Smith would be a big hit on Melrose Place or that Julia Louis-Dreyfus would star on Seinfeld and frankly, they weren't the reason I watched. I was in love with C.B. Barnes also known as Christopher Daniel Barnes. C.B. Barnes portrayed the role of Greg Brady in the Brady Bunch movies in the 1990s and did voices for Spider-Man and Disney movie characters. By then, I had moved on. The funny thing is, I stole his last name and used it as a pen name early in my writing career. I'm not sure why, I guess because he was one of my first favorite celebrities and we were born only three days apart. So back to Day By Day ... Many of you will not remember this show. It was about two parents who quit their busy, successful jobs to start a day care center in their home. 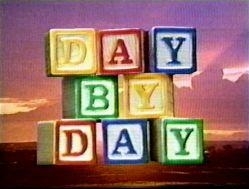 Day By Day was a short-lived NBC comedy - only 33 episodes aired, but I watched every single one! Here's a video clip of the opening theme. I also remember watching this show, although I was only a little kid at the time. It was cute and funny! AND there was an episode where he had a dream he was Chuck Brady, remember?? http://www.youtube.com/watch?v=gapSLY5Fxbo Also, J.L.D. did the Elaine dance on this show long before Seinfeld-I think it was at a class reunion on the show but I can't remember.